Anyone running their Fatbikes as 29+ SS for the summer? Just took my Corvus out at 32/19 at Kincaid in Anchorage. Damn! What a ton of fun. not yet, but that is exactly what i want to do. I want to replace my fatbike. recently i've been considering killing two birds with one stone and buying a fatbike that will accept my lefty fork that i can run with gears and suspension, and building a second set of + wheels and run it as a rigid SS 29+ bike for the summer. I've had 3 fat bikes, all have been SS only. I have a 2015 Fatboy that I'm running SS. 34/19 on our rocky trails out here. It's a blast!! I rode my Krampus SS all summer. It was super fun. You'll want an easier gearing than you would use on a regular 29er - extra rotational mass and diameter makes it harder to push up a hill. I'm thinking about the Wednesday as an SS. Especially with those new tubeless-ready rims. Krampus. I took the rohloff off of it. Had issues with it and it's slow engagement in technical terrain. Now running king hubs, wtb scrapers and dirt wizards. Love this setup. Geared a bit too high at 32/20 for longer / steeper rides, but perfect for my trails out the back door. The Rohloff will go back on for winter (studded nicotines) and for bikepacking. Although I'm thinking of going 1x5 for bikepacking. Krampus. I took the rohloff off of it. Had issues with it and it's slow engagement in technical terrain. A local rider has a Rohloff and best described it was best used for "A touring bike you can occasionally take on mtn bike trails, but you better plan your shifts ahead of time". For me it wasn't about the shifts... I can plan those just fine and never really thought about it. There's no ratcheting over things, or aligning your pedals to clear something and then throwing down power to keep moving or regain balance or traction... its just not there. By feel it seems like 20-30 degrees or more before the pawls (or whatever is inside the hub) engages and moves the wheel. I love it for bikepacking. At least the dirt road / single track riding that I've done - but I ride differently when loaded. And I haven't tried to ride really technical stuff when loaded, I'm usually off the bike. bmike, you are contradicting yourself. If it takes forever to shift from gear to gear, then it is "about the shift". Touring duties don't usually require a snappy shift with demand for instant power like mountain bikes do. It's not about the shifts (for me) - if you leave it in 1 gear and coast along and ride it like a sinlgle speed it takes forever to engage. A Chris King or I9 hub engages much quicker to the pawls and gets the wheel moving under power from the pedals than the Rohloff. Last edited by bmike; 09-05-2015 at 11:56 AM. I 100% misunderstood what you wrote...by bad!! Silly question? Changing a 26" fatbike wheelset for a 24" fatbike wheelset. 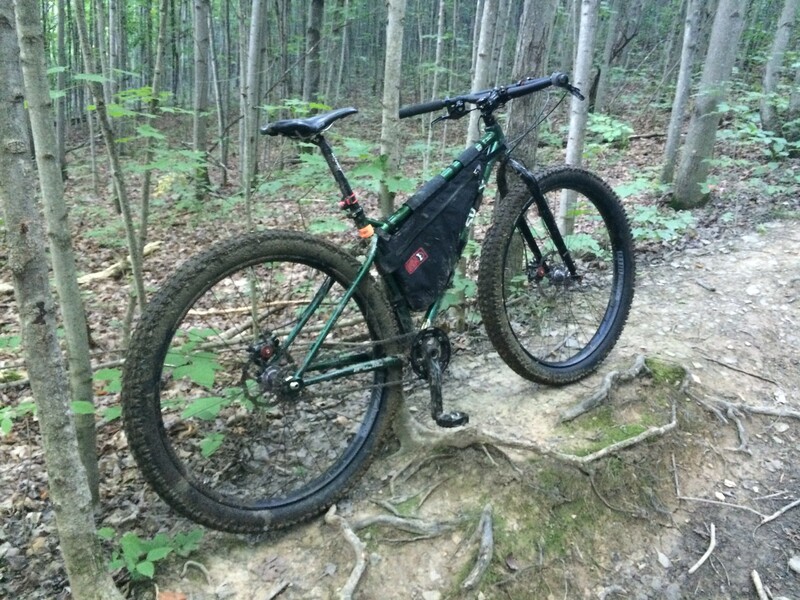 Xpost from Fatbike Forum Klein Clydesdale Full Suspension Fatbike.